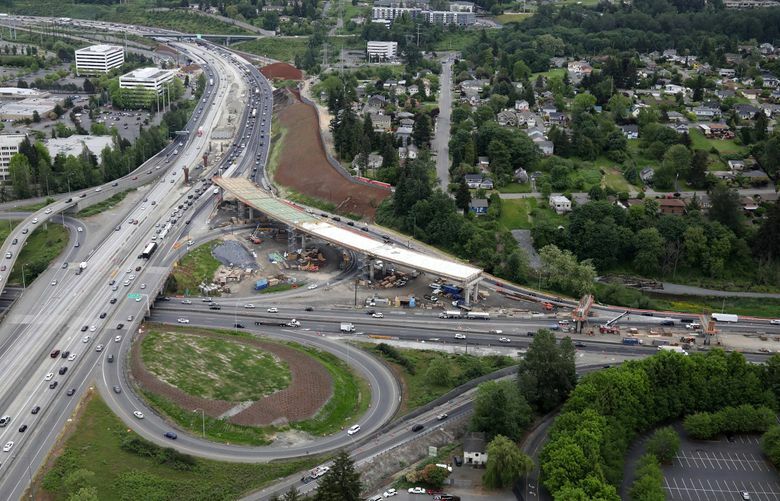 Carpoolers in Renton can expect easier commutes this week when the state opens a giant flyover ramp that joins the high-occupancy lanes of Highway 167 to the carpool lanes of Interstate 405. The new two-way crossing required two years of construction costing $197 million in statewide gas taxes. Drivers endured detours in September while lanes were closed, to install giant culverts through the south Renton wetlands. Weather permitting, the Washington State Department of Transportation (WSDOT) is aiming to open the overpass by Thursday. The state tried to finish by Tuesday, but contractors were unable to set the lane stripes during the wet holiday weekend. This is the first completed megaproject using Connecting Washington tax increases that took effect in 2015-16. Plans were on the books for more than a decade. Gov. Jay Inslee is expected to attend a 1 p.m. ribbon-cutting Tuesday. Linking those interior lanes will enable WSDOT to pursue its vision of a continuous 40-mile suburban crescent of express toll lanes, from Lynnwood to Puyallup. A related $1.2 billion I-405 widening project will result in twin express toll lanes each direction between Renton and Bellevue by 2024, and some general-traffic exit lanes. Meanwhile, lawmakers are considering a bill to combine I-405 and Highway 167 into a single budget. They might use toll revenue to support $710 million in construction bonds. Borrowed money would widen a Bothell bottleneck where two toll lanes shrink to one north of the Sammamish River, and add general lanes in Kent and Auburn. Another potential source might be carbon and car-tab taxes suggested by Senate Transportation Committee Chairman Steve Hobbs, D-Lake Stevens, who seeks cash to replace the aging Highway 2 trestle to Everett, and statewide projects. Any 40-mile plan hinges on the bridge at Renton — a sort of Golden Spike between the left lanes of I-405 to the east and Highway 167 to the south. The overpass is restricted to carpools of at least two people from 5 a.m. to 7 p.m. Solo drivers may use it after hours. Stretches of existing Highway 167 and I-405 toll lanes charge drivers between 75 cents and $10, to save time compared to traveling in clogged general-traffic lanes. Carpools of at least three people are free between Bellevue and Lynnwood at peak times, or at least two people from Auburn to Renton. One objection is that WSDOT’s future conversion of this overpass to toll lanes will fuel the so-called “velvet rope economy,” by favoring affluent people who can afford the faster lanes. “It’s certainly a good thing to have that continuity for the HOV lane, if it’s HOV to HOV,” said David Hablewitz of Bothell, founder of stop405tolls.org. “It is a great improvement in the efficiency of the facility. When they start tolling it, and allowing solo drivers, is when things break down.” Hablewitz expects two-person carpools to decrease, when someday WSDOT requires three riders, to use the overpass and highways toll free. Construction wrapped up four months early, according to Kim Henry, WSDOT administrator for this corridor. Currently, drivers in the fast lane of northbound 167 must weave over two lanes to enter n0rthbound I-405, while going from Kent to Bellevue. Those lanes are often stop-and-go. Carpoolers and bus drivers who exit left onto the new overpass would sustain 60 mph, the project’s traffic study written in 2007 said. However, the mainline carpool lane of northbound I-405 becomes stop-and-go by 6:15 a.m. many mornings, which means commuters zipping on the overpass may find frustration on the north side, until at least 2024 when the express-toll lane is added. “Until we get another lane built, that’s going to be a problem,” Clibborn said.